The Embassy of Israel in Manila is on its 13th year of bringing Israeli culture and arts closer to Filipino moviegoers as it brings Israeli Film Festival 2014. 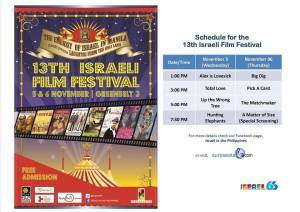 The 13th Israeli Film Festival will run from November 5 to 6, 2014 at the Greenbelt 3 Cinema in Ayala Center, Makati. This is made possible in partnership with the Film Development Council of the Philippines (FDCP), Greenbelt, Film Culture Exchange Program, and Ayala Mall Cinemas. Admission to the Israeli Film Festival 2014 is free on a first-come, first-served basis.